Croatia villas with pools are just the ticket if you are planning a family villa holiday. Choose from villas with pools with wonderful terraces and spectacular sea views, or lush, private gardens. Choose villas with pools near beaches and restaurants, or nestled in quiet villages away from it all. Be within striking distance of a stunning UNESCO old town like Dubrovnik, Split, Trogir, Korcula or Sibenik. Or hide away in a hill top town in the rolling hills of Istria and just enjoy the scenery, gastronomy and wine. Or pick the Dalmatian islands, where you can have your pick of pool or beach and will be spoilt for choice! Browse all our Croatia villas with pools in this section. Palm Tree Villa has a superb position, right on the tranquil sea – just wander down the stunning garden, through the arch and out onto the white pebbly beach. "Loved the villa, clean, comfortable, lots of space and spectacular views - Mlini was a perfect location"
Villa Anamaria is situated just 10 minutes wander from the sea edge in Mlini Bay, with probably the best beaches in the Dubrovnik area & a host of interesting small side streets, cafes, bars & restaurants. Villa Sinatra is a little slice of heaven – tucked away just above the beach and with a beach bar and scrummy restaurant very nearby (just a wander along the lane under the villa). Built in 2014 and located on the edge of the lovely village of Selca, Villa Aspire is becoming a favourite with families and groups of friends wanting some peace & quiet but able to walk to shops and restaurants. "By far the best experience we have had as a family on holiday - The villa was amazing - the concierge was so lovely and went to great lengths to welcome us"
Villa Nicholina is situated in the centre of the village of Mirca Bay, yet located right on the beach - plenty of accommodation for large families and lots to do at the villa or close by. "We had a fabulous week in a beautiful villa"
Situated just above Mlini Bay, Villa Lumiere is close to beaches & restaurants and the centre with wonderful views from the lovely terrace by the pool! "The villa was fantastic, scrupulously clean, friendly owner, lovely pool, super views, 3 mins walk to town, very efficient air conditioning"
Great family villa just above the charming bay of Milna, just 100m from the town & approx 10 minutes walk from the beach! Villa Apartmemt Capri is a gorgeous bolthole in sought after Cavtat Bay close to the old town of Cavtat and its pretty harbour, beaches and delectable restaurants. 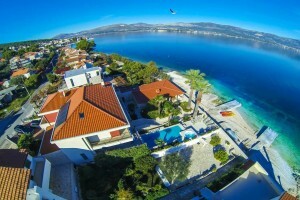 The best Croatia villas with pools are those which also have the best locations and these are not always easy to find. With such an unspoilt coastline Croatia has limited building on the coast and so villas with pools in Croatia are often set back from the immediate sea front area. If not on the sea itself we think that the best properties are within a 10-15 minute walk of the sea, and have amenities nearby to walk to also like restaurants, beaches, shops etc whilst at the same time being in a beautiful, quintessentially Croatian location. These properties tend to be on the Dalmatian Coast in the south of Croatia - the Mediterranean part of the country. Here, villas with pools are dotted around the bays, next to the beaches, or on the edge of pretty bays. They are perched on the edge of a hill with fabulous views or on the outskirts of a little seaside fishing village. There are many different types of locatiion given the organic nature of how the coast has grown up. You won't find many purpose built Croatian villa complexes - villas with pools in Croatia are privately owned family properties that have been in the family for generations and so each one is an individual proposition. Of course, you may not want to be by the sea and in that case, some of the best villas with pools in Croatia are in Istria, in the north of Croatia. Istria is more continental and often likened to Tuscany with rolling countryside, hilltop towns and petty coastal old towns. Villas with pools in Istria are often have more space and bigger gardens with larger pools.